J. Richard Claywell is a Texas-based business valuation specialist working with clients in the legal and business communities. The newsletter is part of a content marketing strategy that coordinates the e-newsletter with the blog. 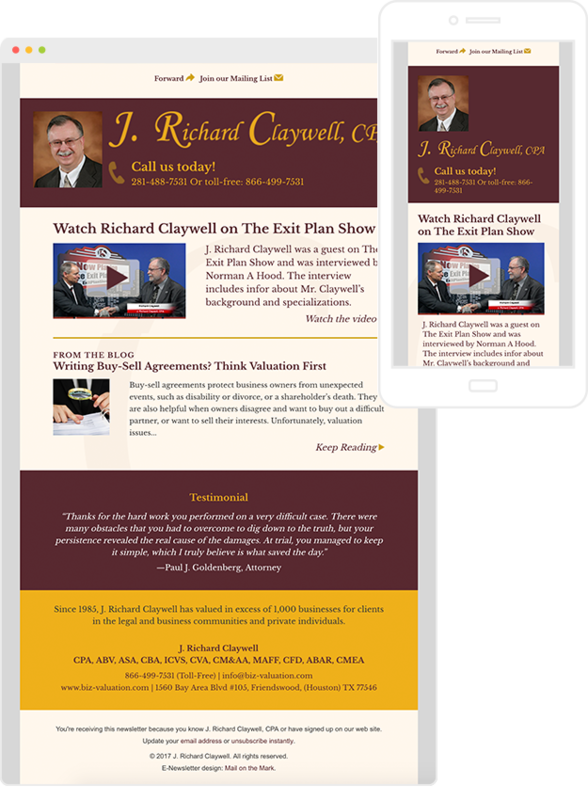 The goal of the e-newsletter is to share news about Claywell’s publications and events, as well as up-to-date industry information. The e-newsletter was designed to match the newly designed web site, and links to the blog. A great way to increase SEO, in addition to getting in front of your known prospects, is to feature your content on your blog and in your e-newsletter. We write and post the content to the client’s blog and then we link to it from the newsletter. We work with Richard Claywell by writing his blog, sending out announcements about upcoming and recent presentations and by sharing valuable articles through his e-newsletter. We have writers who have expertise in specialized fields including technology, health care and accounting. We are ready to dig in and learn about your niche industry.